How can I tell if I have glaucoma? Well, thankfully there are several ways to tell if you have glaucoma. This article will help you determine if you have developed glaucoma. What is glaucoma? Well, glaucoma is an eye condition that damages the main nerve in your eye (the optic nerve). The primary function of your optic nerve is to transmit electrical signals/messages to your brain, so when this nerve is damaged, it impairs your vision, sometimes even leading to blindness. Unfortunately, most people do not realize that they have developed glaucoma until they are partially or completely blind. If you think you may have the beginning stages of glaucoma – do not fret, there are ways to identify glaucoma so that you can get the treatment you need as soon as possible. With proper treatment, your vision and piece of mind can be saved. Listed below are some helpful ways to determine if you have glaucoma. Do you have problems adjusting your eyes to see in different environments and lights, for instance at night, during cloudy days or in brightly lit atmospheres? If the answers are “yes,” you may be developing glaucoma. Hypersensitivity to bright lights, along with squinting and/or constant blinking can also be early warning signs of this condition. Have you noticed any changes in your vision? Is your vision cloudy or do you have a hard time seeing clearly, despite your contact lenses or prescription eye glasses? If so, you may be experiencing the early stages of glaucoma. This eye condition clouds your vision and prevents you from seeing clearly. Have you notice any changes in the shape or color of your eyes? Are your eyes red, swollen and/or crusty? Are your eyes sore and is it painful to blink? If your eyes have physically changed, you may have glaucoma. Increased pressure in your eye can irritate your eyes and damage your optic nerve, leading to glaucoma. Are your eyes really sensitive? Are your eyes itchy, red, extreme dryness, burning, stinging, scratchy and/or extremely sensitive? Do your eyes feel as if sandpaper is in them? Do the constantly “tear up” and water excessively? If you constantly experience eye discomfort or pain, there is a chance you may be developing glaucoma. If the excessive watering and eye discomfort occur more than a couple of days, contact your ophthalmologist for a complete eye exam. Are you experiencing eye-related complications? Is your vision impaired? Is your vision blurry or hazy? Are you having a hard time focusing? Do you ever see black spots, wavy line, halos, bright lights or floating objects in the center of your vision? 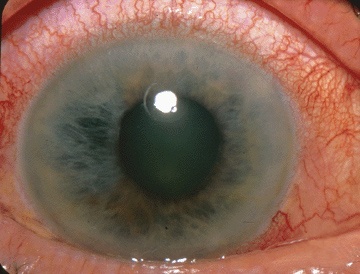 If the answers are “yes,” there is a good chance you may be developing glaucoma. In fact, the first symptoms of this eye condition are: vision difficulties like dark spots and black wavy lines. Untreated glaucoma can lead to permanent vision loss and blindness. Furthermore, if you experience sudden vision loss in one or both eyes, you may be experiencing a severe glaucoma-complication. It is important that you contact your ophthalmologist (i.e. eye doctor) immediately!